Add salt and pepper to the batter. 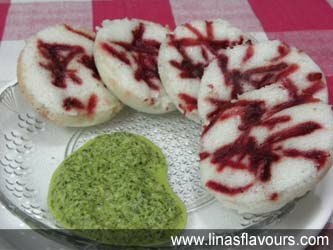 Make two/three parts of the batter depending upon your idli stand. Add 1 teaspoon of baking soda and mix it well. Grease the bowls or idle stand with oil. Pour the mixture into it. Sprinkle grated beetroot. Put it in the idle cooker and steam it for 15 minutes. Generally children tend to avoid eating beetroot. This is the best way to make it colourful and tempting for them.